EQUALUX is 9 weeks away! Thank you so much for choosing to invest in the next generation of LGBTQ leaders in our community! We are so excited by the amount of support that you have already shown for the Scholarship Fund. This year you can expect more social time, food, music, wine and scholarship stories. With your help we hope to raise a record amount that will ensure that our scholars can achieve their dreams. Over the next few weeks, you will receive EQUALUX communications aimed to help you fill your table, give you sneak peaks to special auction items, and get you excited about the event! This week we are previewing a special live auction item: Fly your Pride High on the Space Needle! You and three friends are only the winning bid away from experiencing a once in a lifetime ultimate Seattle moment when you raise the 2019 Pride Flag on the very top of the Space Needle. Surely this will be a Pride you’ll never forget! We'll be sending more information and links to start the bidding as the event draws near so it is very important that you and your guests all register with their emails and mobile numbers. Thanks to the wonderful support of our community, EQUALUX - TASTE of GSBA has been a sold-out event for the past four years. Don’t delay and reserve a table or your seat today! Includes entrance to VIP lounge with entertainment, access to exclusive auction items, valet parking for one vehicle, premium table placement, and wines selected by your personal wine host who will join your table for the evening. Limited number available. To host a table, purchase tickets, or learn more, please visit EQUALUX.org or call 206-363-9188. 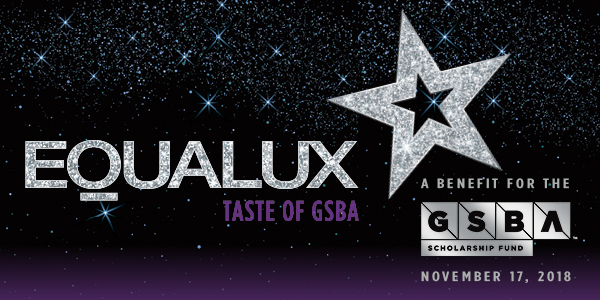 Registration is NOW OPEN for GSBA's signature event of the year, EQUALUX: TASTE of GSBA , benefiting the GSBA Scholarship Fund. Now is the time to reserve your table! EQUALUX: TASTE of GSBA has sold out four years running, and we anticipate the same will happen this year. If you're planning on attending, reserve your table now ! For more details, visit EQUALUX.org .